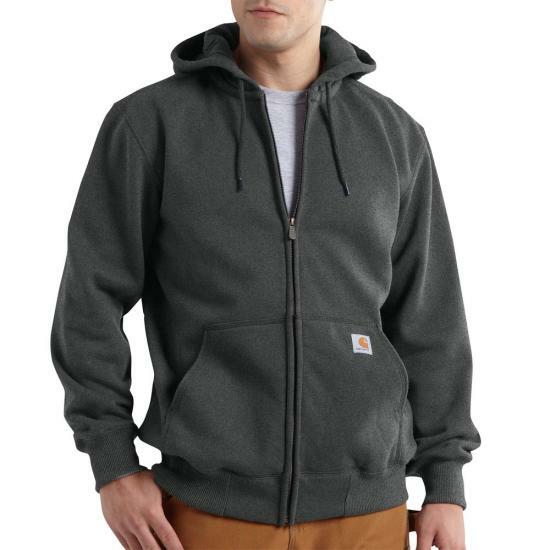 I've had a few K185 Carhartt sweatshirts in the past. This Paxton Heavyweight replaced it. I prefer the extinct K185 over the Paxton for a few reasons. First off, I'm tall (6'3") and lanky. I've always had trouble finding sleeves that are long enough. On my 2XLT Paxton, the sleeves are slightly shorter than the K185 it replaced...to a point where I'd be afraid to throw it in the dryer out of fear of it shrinking. The body fits well enough, though, with just the right amount of extra room. Worth noting, and not to say that I can feel the difference, but the K185 was 80/20 cotton/poly. Carhartt lowered the Paxton cotton content to 75/25. Last, but not least, is a small gripe. On the left sleeve near the wrist cuff, there's some sort of heat applied decal that reads "Rain Defender." It's not removable, and there for keeps. To me, this is the equivalent of a non-removable decal that reads "Double Stitched." As a grown man, I don't need features permanently printed for all to see on any article of clothing. Gift for my hard to buy for husband. He liked it! Warm and fits great. Wear it all the time. Bit shorter than midweight hoodie in overall length, so it's makes better fit than midwight hoodie of looking like wearing daddy's big clothes.Pretty warm in chilly weathers, but it doesn't have protection for neck area, so better wear inner shirts or sweatshirts in extreme conditions. It’s awesome looks great and it’s just what I was looking for.